This was the most enjoyable film I watched in Glasgow. Most of the time I was on the edge of my seat cheering. The hero of this fairy tale, as the writer-director calls it, is Halla (Halldóra Geirharðsdóttir). Halla is a woman in her forties, living alone and seemingly happy with her ‘crusades’ (and the name ‘Halla’ refers to one of the last Icelandic outlaw’ characters in the 17th century)’. Halla has three passions – leading a choir, taking care of the planet and protecting her local landscape. It’s these last two which motivate her declaration of war on heavy industry and the power company. Her heroes are Nelson Mandela and Gandhi. The film’s narrative begins with the one woman war already well under way. A large metal smelting plant has been built close to Halla’s town and power is brought to it by overhead lines which snake across the mountains. The Chinese are said to be interested in investing in the smelter, so protecting it is high on the government agenda. Halla has already managed to cut the power supply more than once and now she has bigger plans. Meanwhile, the company and the government have brought in security forces, the CIA and the latest surveillance technologies to stop her (though they don’t actually know who is causing the power losses yet). But Halla is very fit and resourceful and has some clever ideas. She might not be a superhero, but she is a tough adversary. The narrative has a key twist which I won’t reveal and it has a sub-plot which goes some way to explaining the film’s co-production status. Halla applied some time ago to adopt a little girl orphaned after the fighting in Ukraine. This is a bureaucratic process that appears to be heading for a resolution just as Halla is about to launch her biggest attack. She desperately wants the child but how would her arrival affect Halla’s campaign? Halla is a popular ‘woman about town’. Surely she can’t be a saboteur? The film works because of the wonderful central performance and the comic understanding of co-writer and director Benedikt Erlingsson whose previous film was the cult hit Of Horses and Men (Iceland 2013), which I also enjoyed (and which also featured Halldóra Geirharðsdóttir). The comedy is in the way Halla evades capture and outwits the security forces, but pleasure is also generated by the careful planning procedures and exciting action scenes. I note from going back to a film still from Of Horses and Men, that Erlingsson seems to have repeated the idea of a lone Spanish traveller on a bicycle who is a kind of ‘silent witness’ to all the trouble Halla is causing (and since the authorities don’t know the identity of the saboteur, this poor Spaniard is arrested on the grounds that he is an alien). I wonder if this character played by Juan Camillo Roman Estrada is set to appear in Benedikt Erlingsson’s future films? 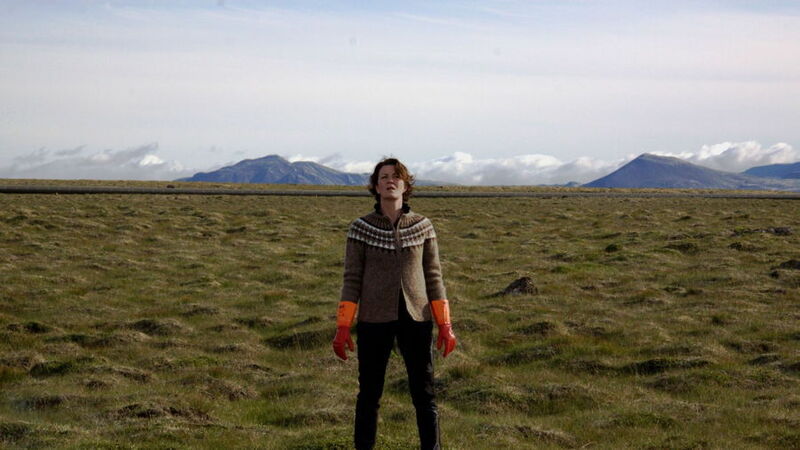 The other big attractions in the film include the Icelandic landscape (beautifully presented in ‘Scope by Bergsteinn Björgúlfsson) and the music. Halla has her own musical accompaniment physically in place with her as she tackles her mission, a wonderful touch. The euphonium is an inherently comic instrument for me. Icelandic films seem to thrive on a certain kind of dark humour. If you enjoyed Rams and Under the Tree, you should certainly enjoy this. Jack (Stig Olin) and Nelly (Inga Landgré) after the local dance. This feels like a Jean Renoir composition. Crisis was the first feature by Ingmar Bergman as director after he worked as a scriptwriter and assistant director to Alf Sjöberg on Torment in 1944. It has just left MUBI’s streaming offer in the UK and is otherwise available from Criterion. Adapted by Bergman himself from a play by the Danish writer Leck Fischer this is a first film with several clear influences and as one critic noted, Bergman was still very much a ‘theatre director’ at this stage. I’m not a fan of Bergman’s later films in the 1960s and beyond, the ones that are usually most acclaimed, but I have enjoyed the handful of his earlier films that I’ve seen and in particular Summer Interlude (1951) and Summer With Monika (1953). I tried to approach Crisis with an open mind. The plot outline of the film is very familiar and a staple of popular entertainment. The setting is a remote small country town by a lake in which Nelly (Inga Landgré), a beautiful young girl of 18, lives with her foster-mother Ingeborg (Dagny Lind) and a lodger, Ulf or ‘Uffe’ (Allan Bohlin), a dull veterinarian in his 30s. No sooner has the town been introduced via a voiceover narration than the ‘inciting incident’ occurs. 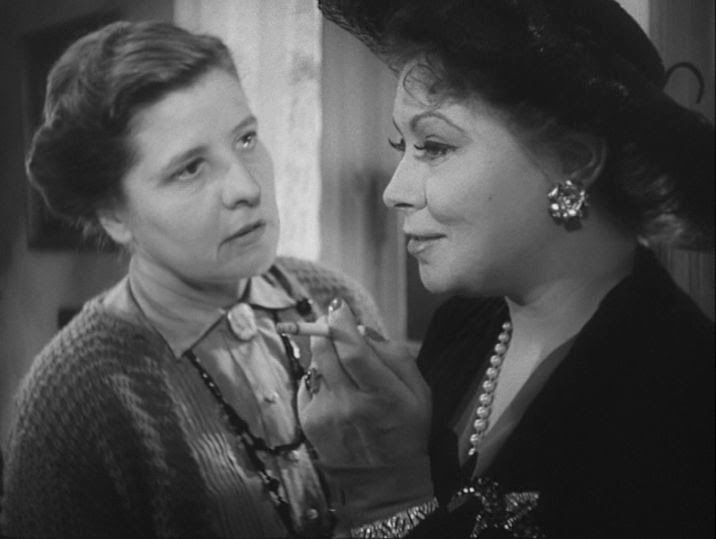 Nelly’s mother, Jenny (Marianne Löfgren), returns from Stockholm to entice her daughter to join her in the city. That night at a local dance, Jenny will meet Jack (Stig Olin), a smooth-talking, street-smart young man who has followed Jenny from Stockholm. Is he Jenny’s ‘toy-boy’? Unaware, Nelly agrees to go to Stockholm. The country mouse goes to town and Ingeborg and Uffe are bereft. If there is a ‘crisis’ in the narrative, it is most likely a ‘crisis of conscience’ as this is essentially a moral tale. Having said that, there is a dramatic climax in Stockholm which eventually leads to a conventional resolution back in the country town. I take the film to be a melodrama and apart from admiring the beauty and vitality of Nelly, I felt most strongly for Ingeborg. The interest in the film is for me in the mixture of stylistic devices. I’ve already mentioned the narration which begins and ends the film. There is also the use of some very loud and dramatic music at moments of drama and music is also a crucial factor in the crude distinction between generations at the dance when a recital in one part of the building is interrupted by the dance band next door – this is the moment when Nelly and Jack first get together. There are similar symbolic moments elsewhere using expressionist lighting and simple effects such as the criss-crossing of railway tracks in a dream. 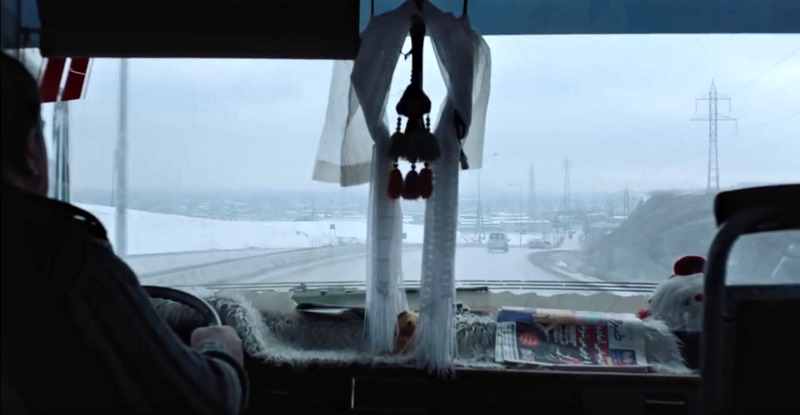 Trains feature heavily in the narrative and at first I thought it was an almost Ozu-like obsession. But the trains are used functionally as night trains transporting the characters between the city and the country town and also simply as dramatic mise en scène with clouds of steam, whistles and other sound effects. 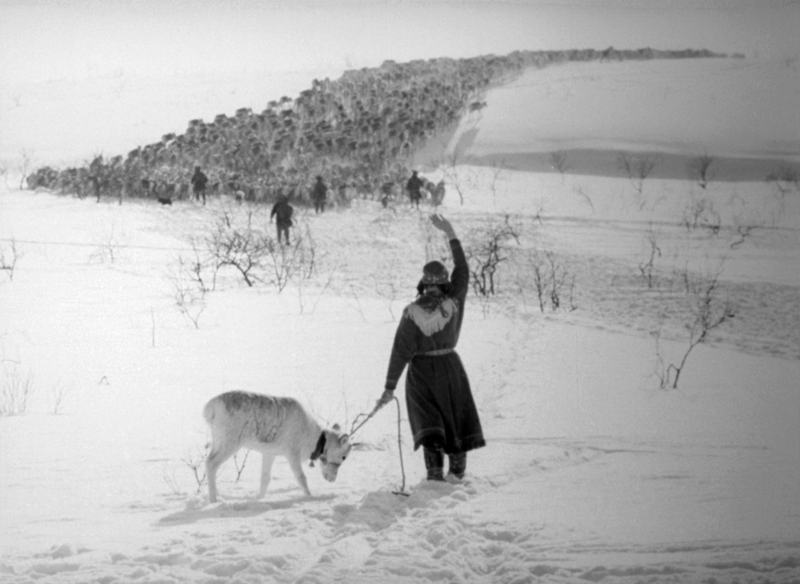 The cinematography is by Gösta Roosling who had experience of four or five features. How much of what we see might be down to Bergman’s ideas? The overall visual style appears to be an amalgam of German Expressionist ideas and French poetic realism alongside some deep-focus outdoor material with long shots that is more reminiscent of neo-realism (which at this time had barely been exported from Italy). 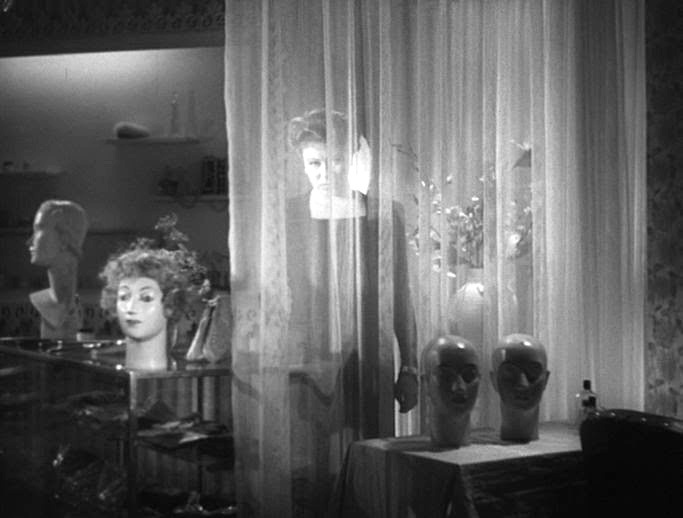 Some scenes are nicely composed in depth and the melodrama use of mirrors and windows is noticeable, especially in Stockholm where Jenny runs a beauty parlour. The dramatic climax takes place on what I assume is a studio set with lighting that cries out film noir. Perhaps there is no clear defining style, but the film is always interesting to look at. One long shot shows Nelly in bed suddenly forced to rise when the door is opened (see above). We see her naked from the rear clutching the sheet to her chest. The inference is clear but I do wonder how such a shot would have been received by censors in the UK or US in 1946. I don’t think Bergman’s films came to the UK before the 1950s when they were sometimes cut for dialogue. 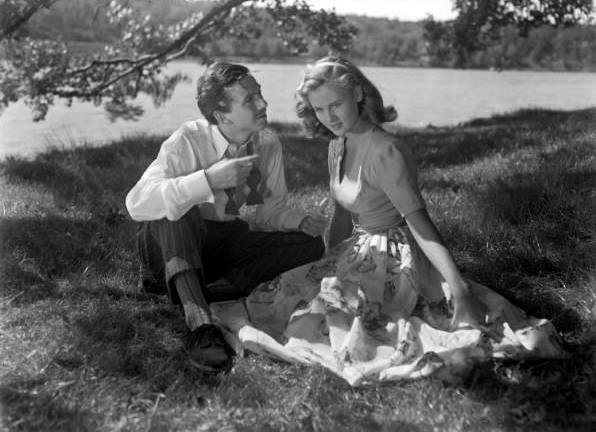 Given that this was a first feature, Bergman must already have built a reputation since there seem to be several official press pack photos from Svensk Filmindustri (SF) in circulation suggesting that there was expected to be considerable interest in the film. This joins the other early works by Bergman that I have enjoyed. The Guilty is Gustav Möller’s debut feature, a low-budget creation based on his own story. Jakob Cedergren plays Asger Holm, a cop reduced to answering emergency calls because of – at the start of the film – an unspecified mistake. Like Locke (2013, UK-US) it is a one-location film, though it expands to an adjacent room rather than just inside a car. The benefits are a cheaper made film; the challenge is to keep it interesting. Cedergren’s performance and Möller’s story are likely to keep most gripped throughout the film and Philip Flindt, the sound effects editor, ensures that the narrative space of the phone calls is created with a magnificent aural landscape. However, it is more than an exercise in style for, as the title suggests, the film investigates the nature of guilt. The slow reveal of Holm’s transgression, and what’s actually happening with the caller he’s desperately trying to help, add a psychological dimension. It can’t quite be called Dostoevskian but there’s enough cerebral nourishment to go with the visceral thrills. In my initial tweeted response to the film I suggested that the direction needed more imagination. Given its low-budget origins, however, this is a little unfair and Möller does a good job. The way Holm isolates himself in another room as he gets deeper into trying to save the distressed woman and his physical reaction to frustration are all satisfyingly cinematic. 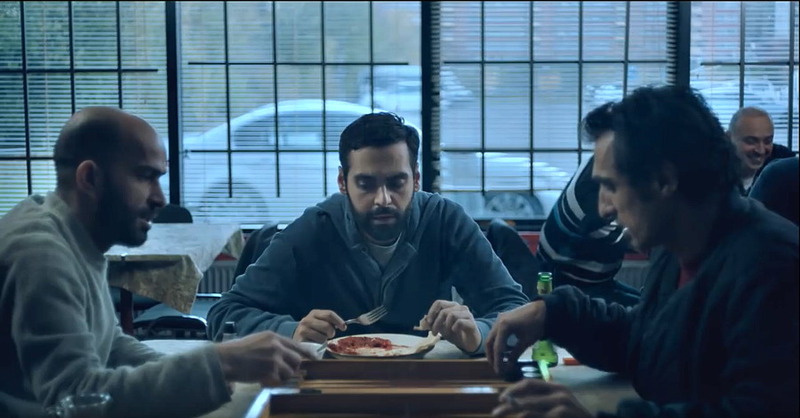 Möller has worked on a couple of episodes of Follow the Money (Bedrag, Denamrk, 2016-) (the first season, at least, was good), one of the plethora of ‘Scandi noir’ TV series that have brought brilliant grimness into our homes. The Guilty is another satisfying example from the dark side of Scandinavia. My first film at this year’s Leeds International Film Festival was a fascinating documentary retelling an anthropological experiment organised by Santiago Genoves in 1973. In what would now be a fatuous ‘reality TV’ format, Genoves placed a multinational group of ten five men and five women, along with himself, on a raft that drifted across the Atlantic in over three months. He’d chosen the participants because he thought their differences would lead to violence; no books were allowed so boredom would ensue. He used questionnaires to test the psychological well-being of the participants. Director Marcus Lindeen reassembled the surviving members (above) to discuss their memories on a replica raft in a studio. 16mm footage from the voyage intersperses their dialogue. Everyone survived the expedition but only six have out-lived death and Lindeen’s coup is to show the narrative of ‘the raft’ via their memories and actuality footage. The reformatting of the 16mm for the widescreen leaves the image extremely grainy; a perfect metaphor for memory. Genoves is represented via the voiceover narration based on his writings: so he is another teller of the tale. Hence the documentary is as much about ‘telling tales’ as it is about the raft. In many ways The Raft is an ‘observational documentary’ as Lindeen ‘shows’ rather than ‘tells’; the voiceover, although telling, is clearly showing one person’s perspective. Spoilers:Genoves failed to find the violence he was looking for so he sought to stir it up. He’d placed Maria Bjornstam as skipper of the crew thinking the men would be resentful. He usurped her place when she said they should shelter from a hurricane. When threatened by a cargo ship he panicked but Maria’s calm expertise saved them; she took back control. We see, ultimately, the Genoves’ experiment tells us much about the type of man he was: full of self-regard, controlling and determined to be successful. His crew get along great amongst themeselves. In a short post-raft TV interview, shown during the end credits, Genoves admits he discovered much about himself but he doesn’t say what he learned. I suspect he blamed others for the expedition’s ‘failure’ whereas it was a great success in that they all survived and the people got along great. The Charmer is classified by IMDb as a ‘psychological drama’ and that may be a possible description, but this is a complex film which draws on several genre repertoires. It might not be a unique take on a modern phenomenon and I’ve certainly seen elements of the story in several other films, but I don’t think I’ve seen them combined quite like this before. We are in the world of migrants attempting to achieve something ‘better’ in a new land, but the narrative begins with a rather shocking action which seems to be immediately forgotten, only to re-appear as an issue much later. Those of you who enjoy second-guessing the mechanics of the plot will probably see the moment coming well before I did. The ‘Charmer’ of the title is a handsome young man (perhaps in his early 30s?). He appears to be facing the chop from his girlfriend after the couple have attended a social event in a beautiful house and garden. We follow him as he disconsolately travels back to what appears to be an upmarket hostel of some kind with quite pleasant rooms. After an interview we realise that he is a migrant applying to stay in Denmark and that his time is running out. The hostel turns out to be less inviting when we watch officials arriving to take one of the other migrants away. The wine bar is the place to find women . . .
Our charmer is called Esmail and he’s from Iran. He earns money by working for a removals firm alongside Amir who has been in Denmark longer. Esmail makes occasional calls home, often being cut off or perhaps deliberately cutting himself off. 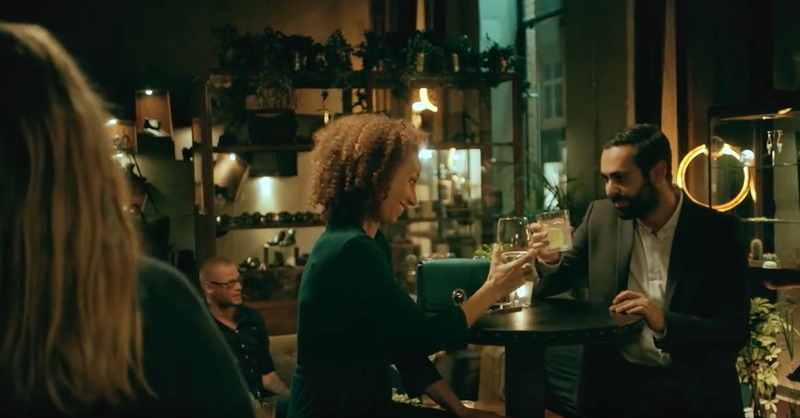 At night he frequents an upmarket wine bar hoping to meet Danish women who might agree to a longer term relationship and provide him with an opportunity to stay in Denmark. But they could easily turn out to be married and just looking for ‘a bit on the side’. The narrative changes when two things happen which suggest different genres. One refers back to the opening of the narrative and creates the threat of the thriller. The other involves Sarah (Soho Rezanejad) a young and attractive woman who is from an Iranian family which is established in Denmark. She sees immediately what Esmail is up to, but she seems interested him. What will her interest lead to? Together these two events will determine Esmail’s future. I won’t spoil the plot further. 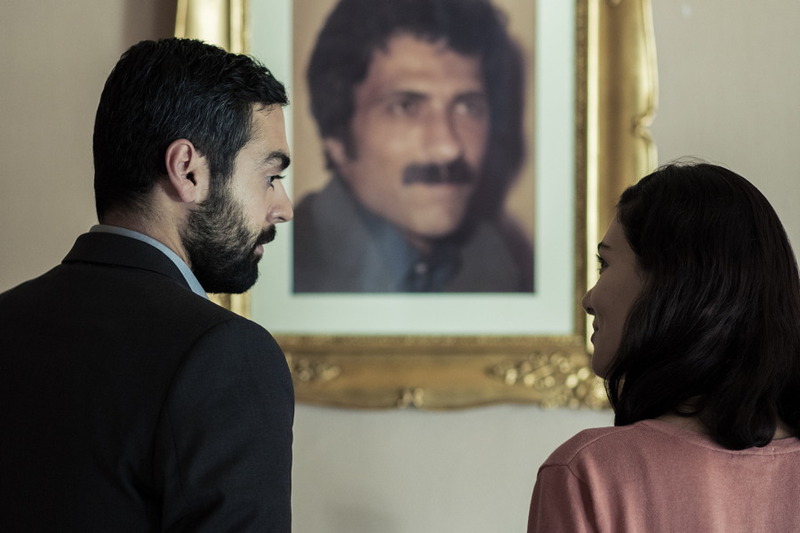 First time director Milad Alami, working from a script he co-wrote with Ingeborg Topsøe, handles the narrative and his lead Esmail (Ardalan Esmaili) very well. (Alami was born in Iran, grew up in Sweden and now lives in Denmark.) We are never quite sure where the narrative is heading and what kind of genre conventions might pop up. The film looks terrific as photographed by Sofia Olsson – who I note shot the film Volcano (Iceland-Denmark 2011) which I saw in Bradford a few years ago when it won a European Cinema Award. Esmail is in a sense a double bluffer. He has learned enough Danish to ‘pass’ as a resident. How long has he really been in the country? But also, who is he? What could he do apart from move furniture? Who is in the family back home? There are answers to some of these questions, but we realise that migrants who make the journey as undertaken by Esmail will always want to keep aspects of their identity under wraps. Iran is different to Denmark . . .
A film like this might fall foul of the censors in Iran, so sequences set in that country were filmed in Turkey. This is a well-made and engaging film with good performances and I think it should please audiences across Europe and beyond. This was screened in programme strand of ‘Pioneer’ – first or second films by directors. Unfortunately it hasn’t yet been sold for UK distribution. This title opened the 2017 Leeds International Film Festival. It was screened in a fairly packed Victoria auditorium at Leeds Town Hall. This has a large well placed screen for the occasion and the illumination levels are suitably low; though you get extraneous light when people enter or leave during the feature. The acoustics are less favourable, especially for dialogue. This feature offers Swedish, English and Danish with part sub-titles. Presumably because of the English dialogue the soundtrack was fairly loud but one could manage. The film itself won the Palme d’Or at this year’s Cannes Film Festival. I am not totally convinced by the Jury’s choice but I could see why the film received the award. It was written and directed by Ruben Östlund whose Force Majeure was one of the stand-out releases in 2014. The bad news for those who enjoyed the earlier title is that Fox have acquired ‘remake rights’. I think this is accurate but it is also that the film has too many targets whereas Force Majeure limited itself effectively to gender and family contradictions. 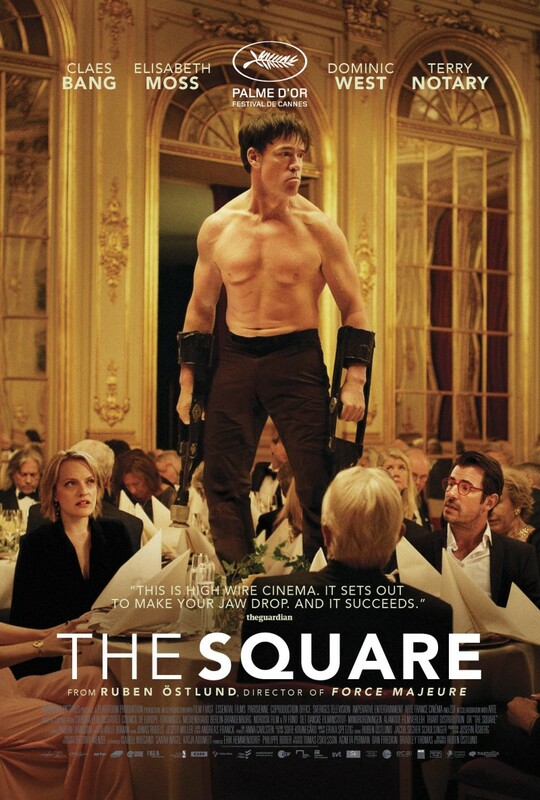 The Square reminded me of the 2016 festival entry Tony Erdmann. Both films follow a picaresque form, both are partly satirical partly dramatic; and both target aspect of European political culture. But both are scripted by the director and I think a specialist scriptwriter would have improved the work. It is the sort of film that Jean Claude Carriere would have been good on. It is a film I think I will see again. It goes on general release via Curzon (who follow somewhat restrictive practices) in 2018. It has a couple of genuinely shocking sequences. The BBFC have not released their certification yet but I would expect it to receive a ’15’.